Unique and unusual chests of drawers that you’ll love. Our chests of drawers are perfect for clothes and other items: from three drawers to sixteen drawers, we’ve got you covered. 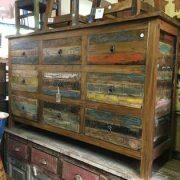 Choose from a variety of chest of drawer styles and designs including hand painted, old, vintage, industrial, reclaimed, sheesham. All of our Indian chest of drawers are handmade from wood, and are available to buy online or in our Brighton & Hove furniture store.